Texas Gov. Greg Abbott declared a state of disaster in an additional 24 Texas counties Monday, due to recent damage from thunderstorms, tornadoes and flooding. The governor was expected to visit Wichita Falls and Wimberley Monday, to survey the areas hardest hit by recent storms. After which, at about 10:30 a.m., the governor is expected to speak. Video of that statement will appear in the player at the top of the page. Earlier Monday, Abbott today declared a state of disaster in an additional 24 Texas counties: Archer, Bastrop, Caldwell, Cass, Collin, Dewitt, Fannin, Grayson, Harrison, Hays, Henderson, Hidalgo, Hill, Houston, Kendall, Jasper, Johnson, Newton, Nueces, Parker, San Jacinto, Walker, Wichita and Wilson counties, authorizing further mobilization of state resources to assist impacted communities. Additional counties may be added to the declaration as the situation develops. 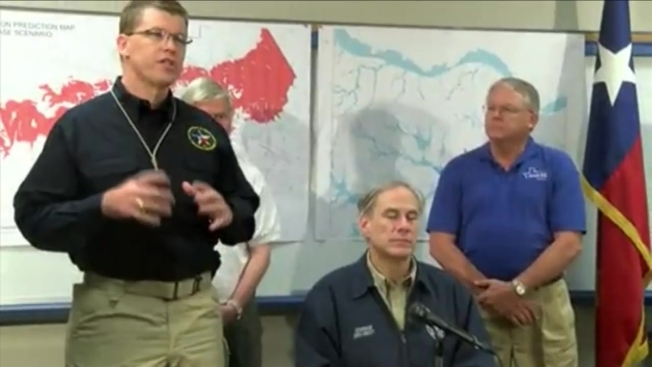 On May 11, Abbott declared a state of disaster in Bosque, Clay, Denton, Eastland, Gaines, Montague and Van Zandt counties. On May 15, he added Cooke, Grimes, Hood, Navarro, Smith and Wise counties. The Governor’s declaration follows an elevated activation of the Texas State Operations Center (SOC) to enable rapid deployment of state resources announced on Friday, May 4. Current forecasts indicate the continuation of possible severe thunderstorms, large hail, damaging winds, flash flooding, river flooding and tornadoes across the state throughout the week. At this time, any additional rainfall will exacerbate already saturated grounds, which could quickly lead to dangerous flash flooding and extended river flooding. The State Operations Center – in coordination with the Texas Emergency Management Council – remains at an elevated activation level and is continuing to monitor weather conditions and coordinate with the National Weather Service.